He was born in Cremona in 1959, and when he was young dedicated his time to artistic wood sculpturing and inlay. In 1978 he graduated from the International School for Violin-Making in Cremona, under the guidance of Maestro Morassi and with the judgment of Maestro Rocchi. He has made a name for himself in various exhibitions and competitions such as those in Bagnacavallo, Firenze, Poznam, Ortona, Kassel, Gorizia, the Triennial Competition of Cremona, and V.S.A. United States. Since 1980 he has been a practical workshop teacher of instrument construction and varnishing at the School where he learned. He makes instruments inspired by the models of the great masters of the past (Stradivarius, Guarneri) as well as personal models. In addition to constructing instruments of the classical quartet, he specialized in the restoration of antique and precious instruments. 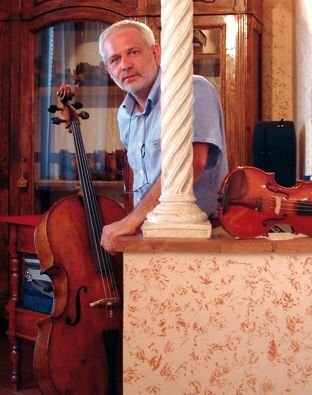 An expert in radiography and analyses of varnishes under Wood light, he is responsible for the scientific laboratory at the International School for Violin-Making. He collaborated with Prof. Ciro Moschella in producing the book "Modern Italian Violin-Making of the 19th and 20th centuries" (“Liuteria Italiana Moderna dell’800 e ‘900”). He has been a founder of A.L.I. (the Italian Association of Violin-Makers) and of the Violin-Makers and Bow-Makers' Consortium of Cremona.